'Wallet' which people carry to keep their cash or cards safely during travel or journey. But, now a days it seems to be a forgotten phenomenon as 'Virtual Wallet/e-wallet' is trending out. These virtual wallets are not carried physically but they are in our smartphones. They work as same as normal wallet. Hence, when one require to pay at any point of time one can. As the name suggests 'Pre-paid' means the user needs to transfer the money virtually to the wallet from his bank account. The prepaids Instruments can be issued as Mobile Wallet, Internet Wallet, Prepaid cards, smart card, paper cards and few more. Prepaid payment Instruments are defined in the guidelines issued under the Payment and Settlement System Act, 2005. These are issued by any entity to by product from it only. Ex- online shopping website(Myntra, Flipkart etc) or Travel portal bonus point or cash backs. Cash withdrawal or redemption is not possible in these Payment Instruments. Hence, RBI approval is not required to issue these Payments Instruments. These Payment Instruments can be used for purchase of goods and services at a group of clearly identified merchants/locations/places which have a specific contract with the issuer to accept the Payment Instrument. These Instruments do not permit cash withdrawal or redemption by the holder. One can send money to other account. They can be recharged or topped up. Money stored in Wallet is actually in the companies account.Example: Paytm, Airtel money, Vodafone mPaisa, Mobikwik etc. These Payment system can be used for purchase of goods and services including financial services like fund transfer at any card accepting merchant location( Point of sale terminal) and also permits cash withdrawal at ATM. These can be or sometimes can't be recharged or Topped up. Only Banks can issue these Instruments. Cash withdrawal permitted. Example: MasterCard, Rupay(Indian one), Visa etc. 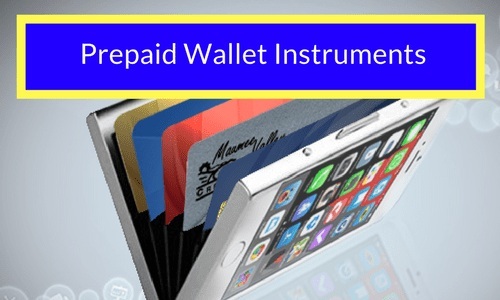 Who can be an issuer of these Prepaid payment Wallet Instruments? Only those companies incorporated in India with minimum paid up capital of 5cr. And positive Net worth of 1 cr. Banks who comply with eligibility criteria of RBI are permitted to issue all kinds of PPIs. However, those banks which are permitted for mobile banking can only issue mobile based Instruments. Non Banking Financial companies (NBFCs) are permitted to issue only semi-closed Payment Instrument.